Home News Three Years of success - University of New York in Prague voted into Superbrands 2018! Three Years of success - University of New York in Prague voted into Superbrands 2018! 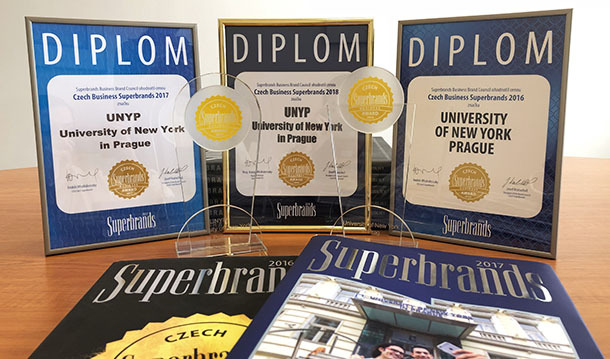 The University of New York in Prague (UNYP), has won the Czech Superbrands award for the third year in a row. “Three years recognized for excellence in our marketing as well as our reputation is a great honor. This is possible because our staff and our students strive for excellence at every opportunity,” commended Mark Anderson, Marketing Director of UNYP. The title is awarded by a panel of experts and is evaluated on areas such as brand knowledge, innovation, prestige, business results, and also the quality of the brand itself. “The true product of UNYP is our alumni, and with nearly 3000 graduates over the last 20 years in top positions around the world, it’s no wonder why UNYP continues to be recognized for its excellence. Just this month two of our Alumni were in Forbes CR ’30 under 30’,” added Sotiris Foutsis, General Manager of UNYP. UNYP has been delivering the very best in English language higher educations in the Czech Republic for 20 years, since 1998. The University offers both American degrees through its long term partnership with the State University of New York, Empire State College as well as UNYP degrees accredited by the Czech Ministry of Education, Youth & Sports. The University offers degrees in a variety of study fields from Business Administration, Communications & Media Studies to Psychology across bachelors, masters, MBA and Ph.D. degrees. The University of New York in Prague remains – according to the professional jury of communications and marketing professionals – the official leader among private universities and business schools in the Czech Republic. This success is down to both its long-term, high standards in marketing as well as the quality of its education, staff, faculty, alumni and activities; because of them, the University of New York in Prague brand enjoys such popularity and prestige. A logical synergy of these factors is excellent business results, innovative communication and a strong brand awareness.